Mother Mash have created a bit of a buzz around the blogosphere so I felt obliged to check them out. Specialising in that old British tradition of mashed potato they have more varieties of mash than I knew existed. There is mash with cheese, mash with horseradish and Irish mash with cabbage called colcannon. It was great to have such a choice of mash but it is never going to be a meal in itself. The reason I was visiting was of course because of the healthy choice of pies on offer to go with the mash. They also specialise in sausages. Sausages are of course a fine institution but you’ll be pleased to know they get no further mention in this review because I have my eyes firmly focused on the pies. The restaurant has a nice ambiance and I love the wooden booths they have, just like a traditional London Pie and Mash shop. Unfortunately our first choices of Aberdeen Angus Steak Pie and Chicken, Leek & Mushroom Pie were sold out. I guess this only goes to show how popular they are! In the end we settled for a Minced Beef Pie and a Chicken & Mushroom Pie of the day. Because they had sold out of our pie flavours they gave us some free peas, how nice. I was very excited when I found out there was a choice of FIVE gravies which is something I haven’t seen before. This was a very nice touch as the significance of gravy is often overlooked. Choosing the right gravy to go with your pie is as much of an art as choosing a complimentary wine. It is, unfortunately, normally the case that a pie is just supplied along with very generic gravy so as to be utilised alongside a variety of dishes. They say the first bite is with the eye. In that case my first bite was lip smackingly delicious. These pies arrived in a wonderful traditional style without trying to do anything fancy. 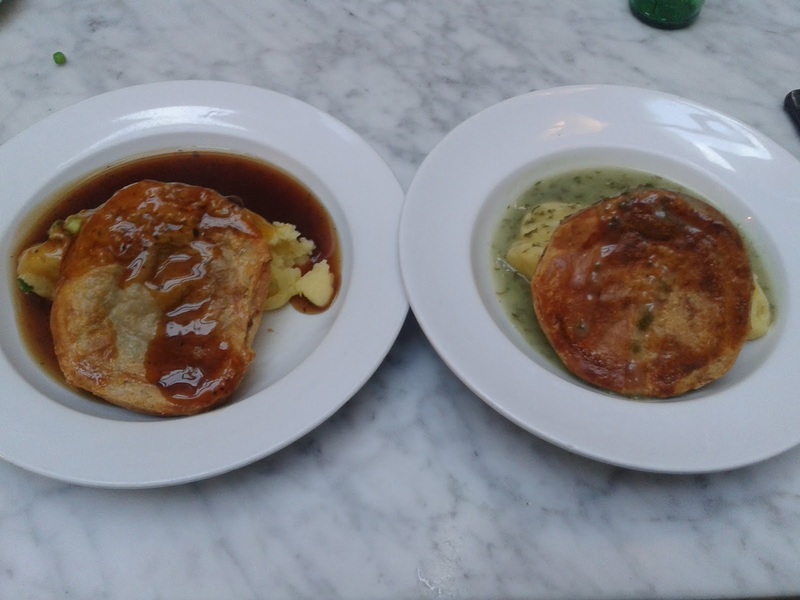 Presented tilted on a bed of mash with oodles of gravy these pies wouldn’t have looked out of place in an art gallery as a pair of timeless classics. They didn't have a perfectly consistent Colour but I liked this, it gave them a hand made appearance rather than a manufactured appearance. Pies like this have been served for generations in London Pie and Mash shops. Some of my ancestors are Londoners and I like to imagine they would have tucked into similar meals generations ago and it is nice to have that continuity in an ever changing world. Okay, so these pies looked beautiful but you can’t judge a pie by it’s cover, it really is what's on the inside that counts. 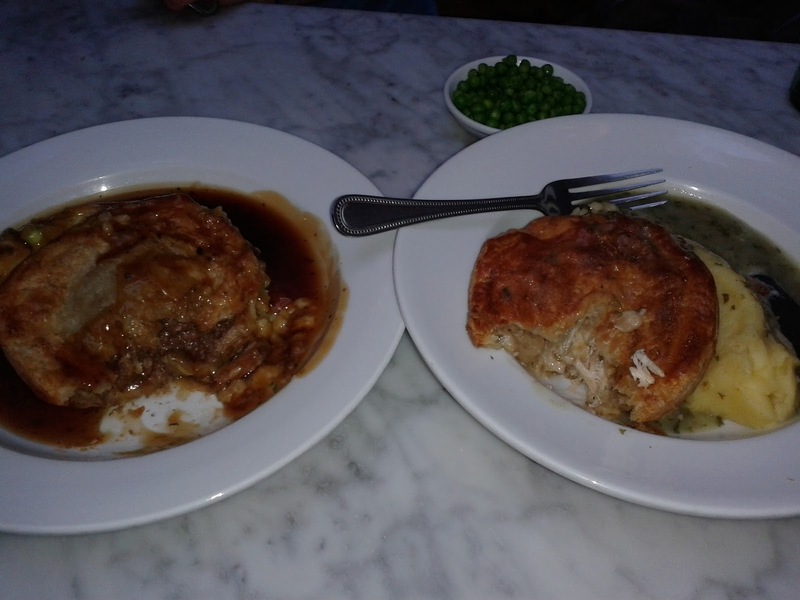 As I disembowelled my Chicken & Mushroom pie the large chunks of meat were as plain as the nose on my face. In fact they were a pretty similar size to my nose (which is no mean feat if you have ever met me). The sauce inside the pie was lovely and thick and had a lovely rich chicken taste. I couldn’t really taste the mushroom at all, however I am not much of a fan of the edible fungus so I wasn’t too disappointed. The outside was pastry perfection, crunchy on the outside while gooey on the inside. My pie was complimented well by the liquor I had with it with it which is a cross between gravy and parsley sauce. This was again very reminiscent of the pie I had at L. Manze in Walthamstow a traditional pie and mash shop. Overall, at £10.50, this pie is priced competitively for central London. In terms of the quality of the pie meal it was comparable to my current favourite of Canteen. However, this pie was cheaper, hence a very high score and currently my favourite restaurant pie in London.